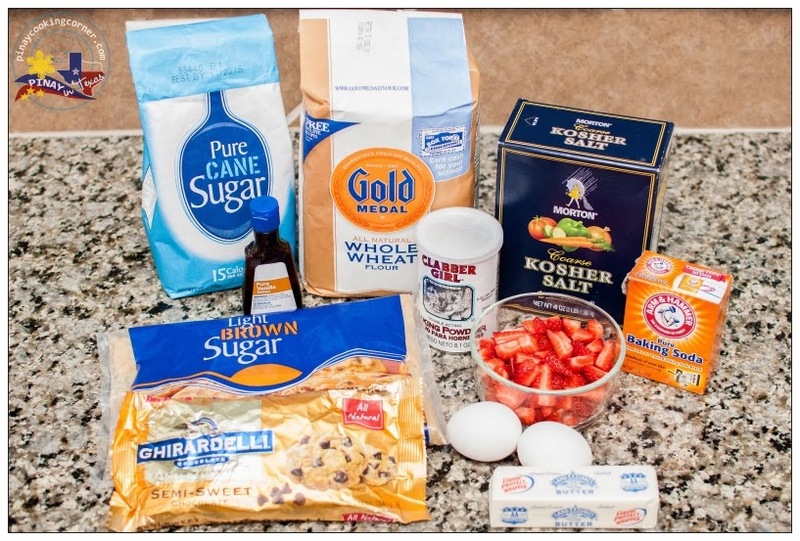 My youngest daughter has long been requesting me to make Strawberry Cookies. Well, I finally gave in to her request the other day. 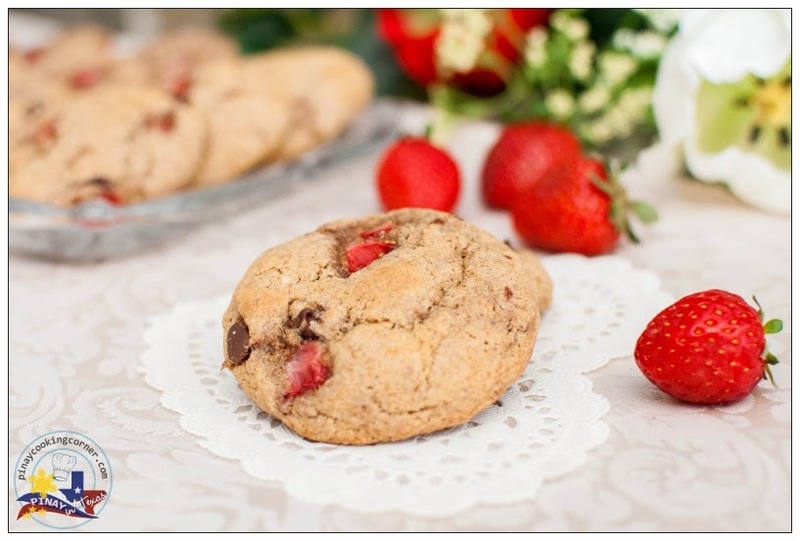 But since my eldest daughter isn't a big fan of strawberries, I thought of making Strawberry Chocolate Chip Cookies instead of just plain Strawberry Cookies. That way, I can be sure that both my daughters will eat them...and to make the cookies healthier, I used whole wheat flour. We all loved how the cookies turned out! Indeed, the combination of strawberry and chocolate never fails to please. The only drawback is that the cookies turned kinda soft and a bit soggy the next day. So I suggest you either make a smaller batch and eat them fresh from the oven, or you refrigerate your leftover cookies. My daughters enjoyed eating the refrigerated cookies for dessert. Hope you'll get to try the recipe...and if you do, let me know what you think. Hope your day will turn out as lovely as you want it to be! 1. Preheat oven to 350°F. Line 2 cookie sheets with parchment paper. 2. 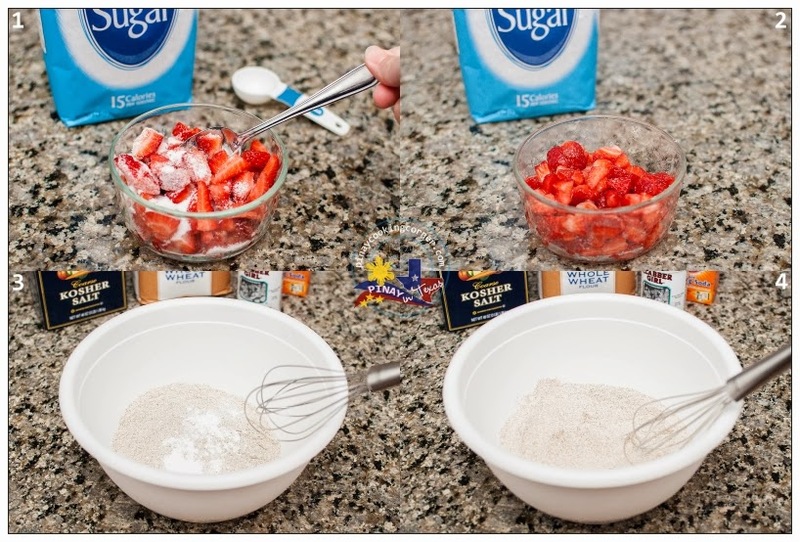 In a small bowl, mix strawberries with 2 Tbsp sugar. Set aside. In a bowl, combine flour, baking powder, baking soda and salt. 3. In another bowl, cream butter and sugars using an electric mixer on medium speed until light and fluffy. Add eggs and vanilla and continue mixing until well combined. Reduce speed to low. 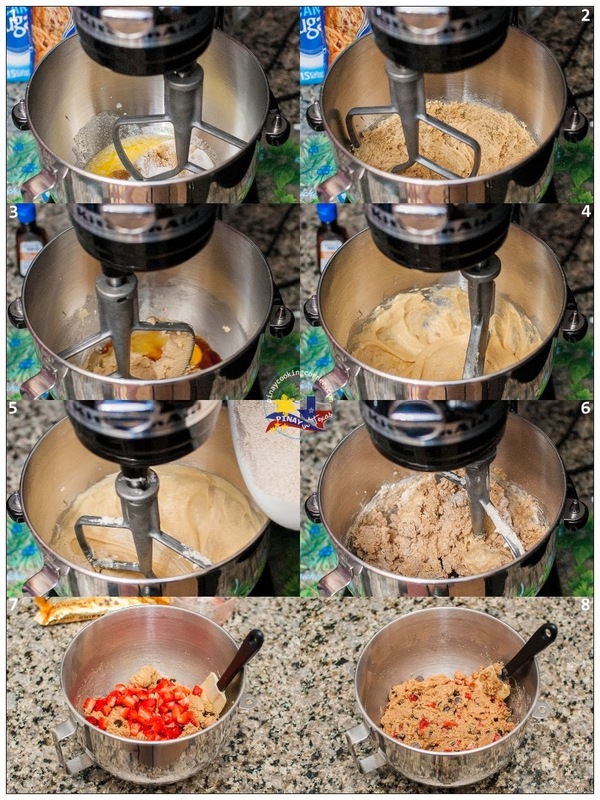 Gradually add flour mixture and beat until well incorporated. Stir in the strawberries and chocolate chips. 4. Scoop dough onto prepared baking sheet with proper spacing. Bake in preheated oven for 10-12 minutes or until slightly golden around the edges. Let the cookies cool a few minutes on the baking sheet. Transfer to a wire rack to cool completely. 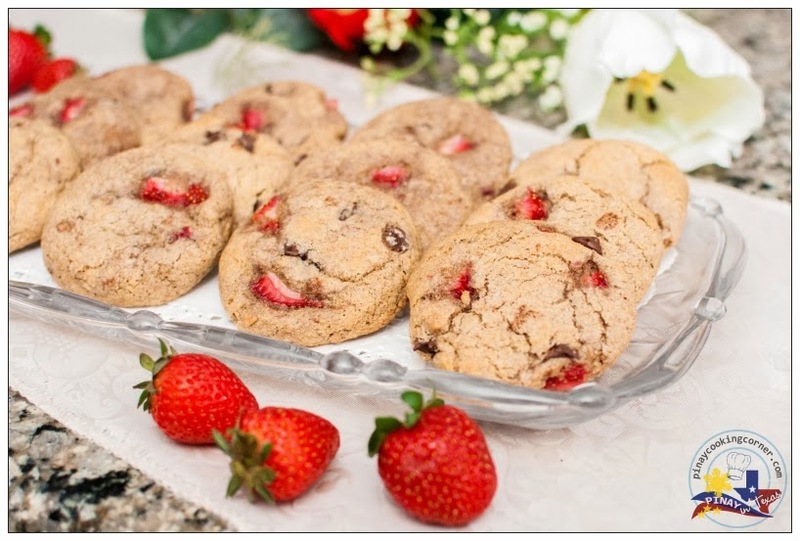 Note: The strawberries release juice so the cookies will be soft on the second day. If cookies won't be consumed within 24 hrs, put them in a ziplock bag and refrigerate. Great combination of strawberries and chocolate! 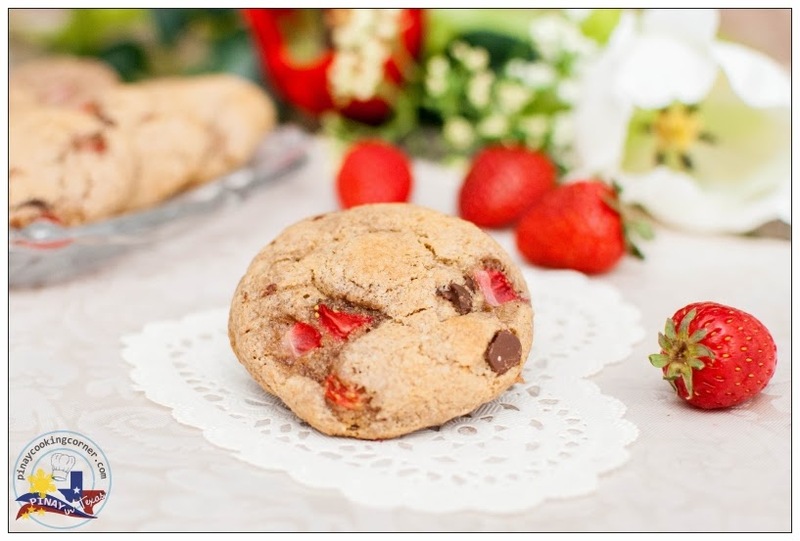 I have never used strawberries in cookies but I'm dying to try after looking at these.